I have mixed feelings about back-to-school season. My kids are really excited to get back to the daily routine and see their friends again, but I truly enjoy the summer weather and the time we get to spend together as a family. 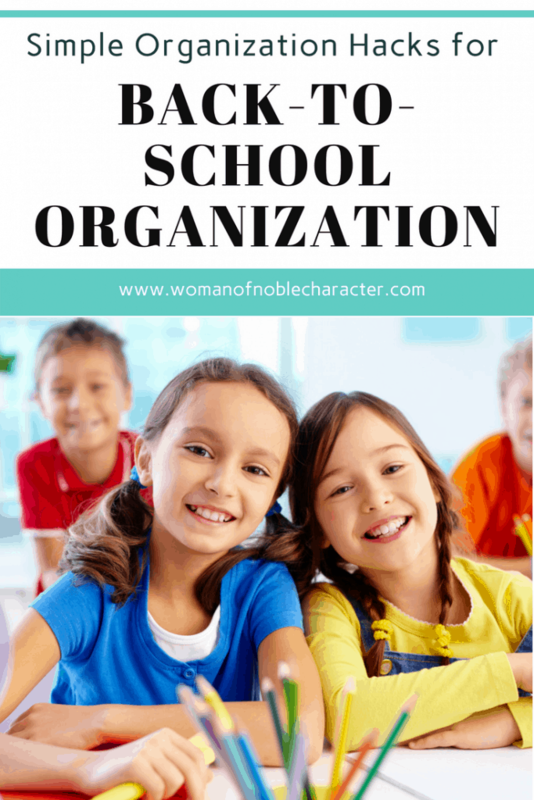 Alas, it is coming to a halt very quickly, and it’s time to discuss how to get your family organized for the upcoming school year. 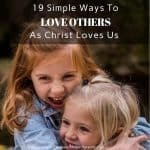 I, personally, have five tried and true methods that I believe each and every family should employ in their homes around this time. Trust me, they eliminate the stress of the daily school routine if used correctly. Check them out and let me know what you think in the comment section below. I’m a strong believer in each family having a command center. We rely very heavily on ours and, while it’s not fancy, it keeps the stress level down. Of course, you can include anything you think will make it easier on your family, but the following are a few of the things we track in our own home. I have a wonderful whiteboard calendar that we use regularly. 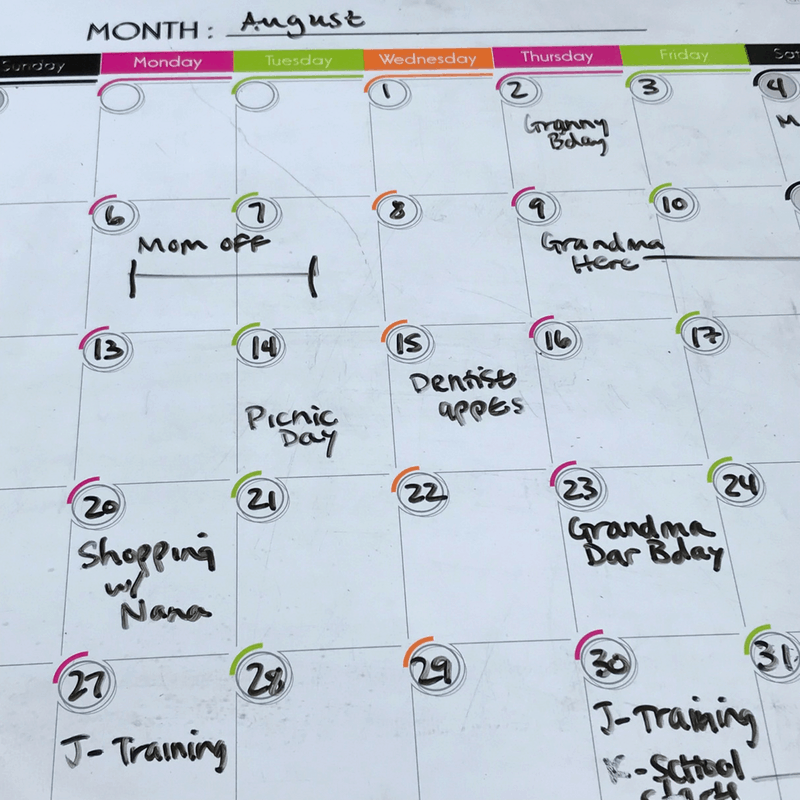 While my husband and I are dependent on our phone calendars, my daughters love knowing what is happening each day of the month, so at the end of each month, we work to fill it out with them, adding birthdays, big events, and anything else that might be of interest. In fact, during the summer months when we don’t have much going on, my eleven-year-old has taken the job on herself. She’s always excited when a new month starts and she can see the new events and send birthday cards to family members. Our weekly schedule stays mostly the same, with slight variations during the different seasons. Even so, I believe that it’s important for all of us to see what happens each and every day of the week. Once again, we have a weekly calendar whiteboard that we add our commitments to and often use as a place to leave reminders for one another (specifically when we have run out of an important food item). I love corkboards because there is so much you can do with them. In our case, we have one for each child and they are responsible for hanging their school papers on them each day (because seriously…there are so many papers). For us, if it doesn’t make it to the corkboard, then I am not responsible for having seen it. I’ve added chore charts and daily schedules to the corkboards at times and my husband frequently leaves the girls notes on their boards when he has to leave before they wake up. It’s a great way to communicate, as well as maintain consistency. Having a daily schedule is effective for many young children. 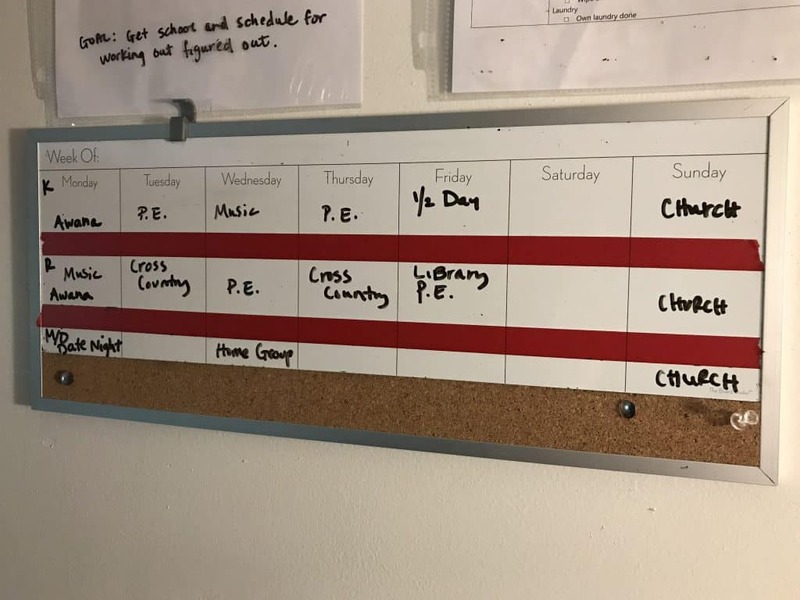 For mine, being on the autism spectrum, having stability in their schedule is imperative to their success, so I create a school day schedule specific for each child. After a while, the actual paper schedule becomes unnecessary because the children know exactly what to do and when to do it but starting off with the schedule at the beginning of the year ensures success going forward. In my opinion, each child needs to have some responsibility when it comes to contributing to the family environment, which is why I’ve included a chore/responsibility chart for each of my children. It changes frequently but allows each child to participate in helping out with family responsibilities. We attach ours to the corkboards, however we have had success in the past adding these to the side of the refrigerator. Whatever method you use, make sure they are written out in such a way that your child can follow the directions and be successful in their tasks. Looking for a template to start your own? You can find one here. I don’t know about you, but I’d love to have an entire closet designated for supplies, but that’s just not the case. Instead, we have a shelf in our storage room with extra paper, pencils, erasers, highlighters, and scissors, among other things. Anything your child needs to have in the classroom should be accessible at home for homework purposes unless they carry their school supplies around with them as many middle and high schoolers do. How you organize these it completely up to you. If your child eats breakfast and lunch at school each day, you can skip this part completely, but for those who have their children take cold lunch, it’s important to have a system in place. Personally, we have two tactics we use to keep us organized. We do our major monthly shopping run on the first day of each month. At that time, my daughters have the opportunity to pick out their favorite snacks for the entire month. They are allowed to take four things in their lunch each day, one of which is a sandwich or leftovers from the night before, one is a piece of fruit (apple, orange, or banana) and the other two items are left to whatever they have in their lunch bins. So, when we go shopping for the month, they get the opportunity to pick out that months’ food items. Typically, my youngest will choose yogurt tubes and fig bars, while my oldest gravitates towards applesauce cups and chips. Some months they will pick granola bars, veggie straws, and/or animal crackers, among other things. As long as it doesn’t exceed the budget, I give them full control over these options. When we get all of the items home, we split anything not already prepackaged into small portion-sized bags and add them to the lunch bin. This keeps all of the lunch items separate from the things they are allowed to eat at home during other times of the day. If they do choose to take more than the allotted amount for the day, then they will find themselves unhappy when they don’t have enough of the “fun stuff” to get them through the month. Trust me, that lesson of responsibility only needs to be taught once. 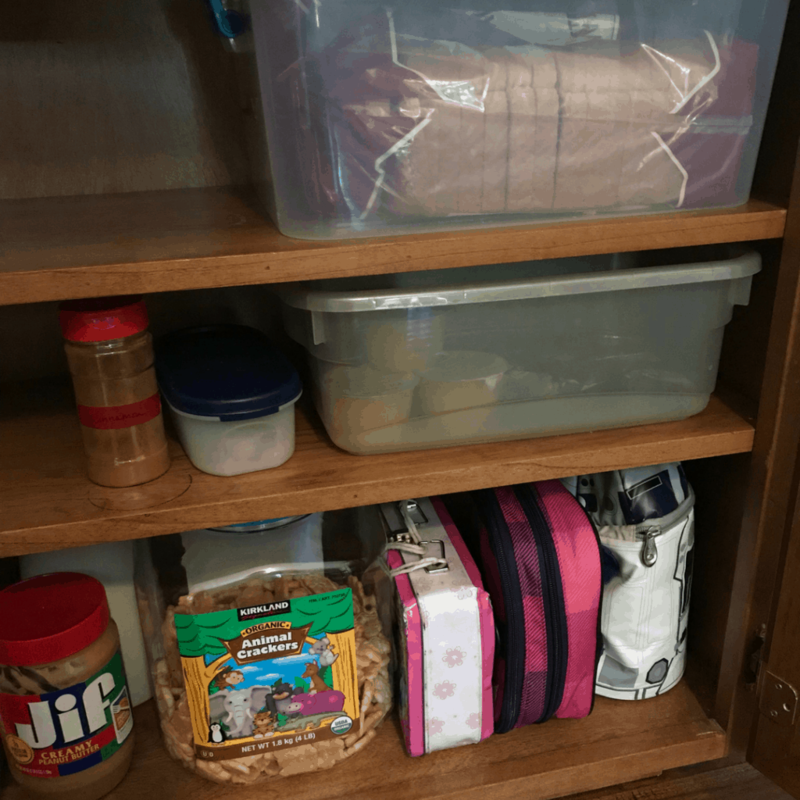 In addition to the lunch bin, which obviously is not stored in the cupboard, we do have a lunch cupboard for storage of bread, peanut butter, and lunch boxes. This cupboard is an effective way to keep the girls’ lunchboxes contained, while also providing them access to the additional items they need for making sandwiches for their lunches. We’ve made sure that it is a cupboard they can easily reach and that it’s cleaned out frequently (because no one likes moldy ends to the bread). I gave up long ago trying to keep all of my daughters’ shoes, coats, and backpacks organized alongside mine and my husbands’. Instead, we turned a small broom closet into a kids’ zone. It’s at the back of our home, so they can enter and exit with their dirty shoes and coats through the back door, which is also a great bonus. Due to the fact that hangars can be hard to use for younger kids, we attached some wood hooks for the girls to hang their backpacks, coats, scarves, and snow pants on. 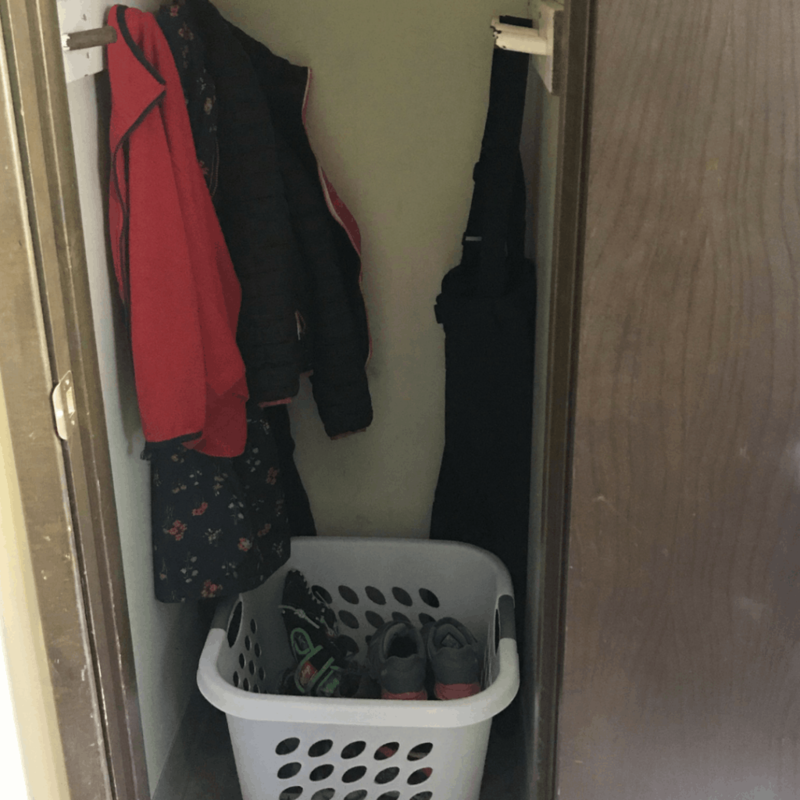 They have a large laundry basket for shoes, boots, and other miscellaneous items including hats and gloves. It keeps all of the stuff they need in one place, which makes getting out of the house in the mornings that much easier. In order to stay organized during the school year, each child needs a homework station. 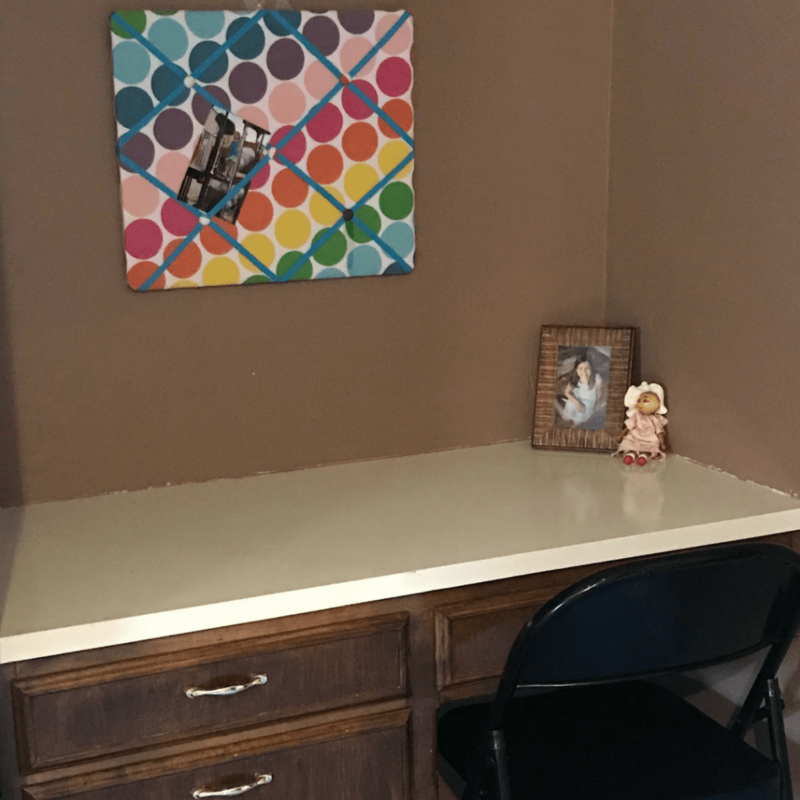 This can be as simple as a desk in their room, a place at the table with pencils and pens nearby, or a designated homework spot in the living room. No matter where that spot is, make sure that your child uses it each and every time they need to do homework, and that the supplies they need are nearby and organized so they don’t waste valuable time searching for them. Personally, we use a combination of a desk for one daughter and a table in our basement for the other. It’s proven effective, and while one daughter has a drawer with all of her writing utensils in it, the other has a box with pencils, pens, and other items necessary. Do whatever is necessary to ensure the success of your child when it comes to homework. It might not solve the math problem, but it will at least alleviate some of the frustration. 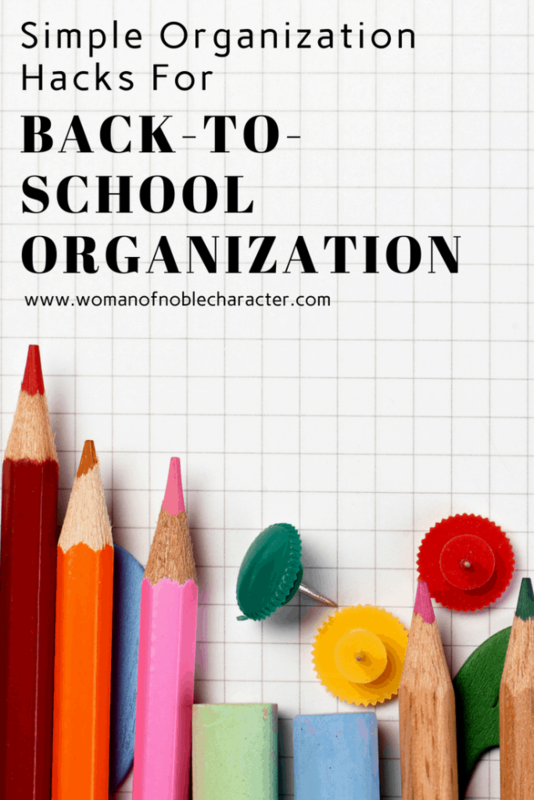 I know it may seem like there is a lot you need to do in order to organize your family for the upcoming school year, but I’d like to encourage you with the fact that by putting in the effort now, you will save yourself a lot of stress come the middle of the school year. 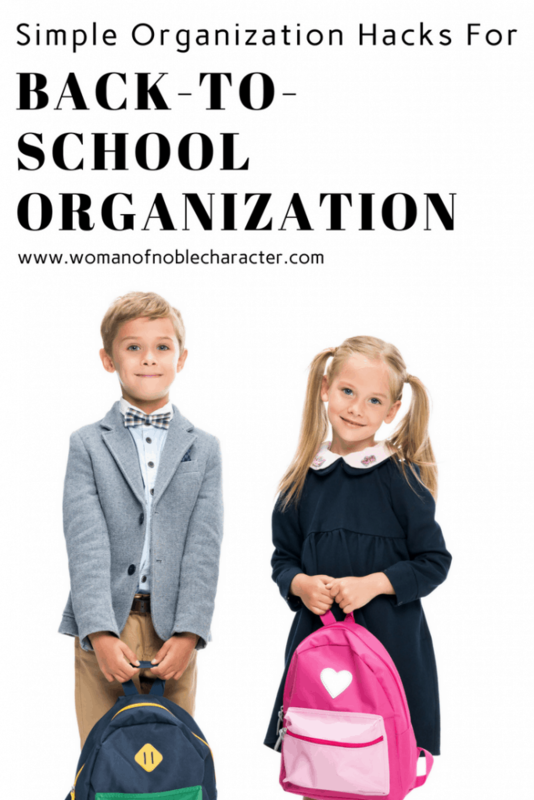 Sure, schedules will change and children will refuse to follow directions and yet, if you’ve instilled a routine and a series of solutions to keep your family organized, it will eventually become second nature for your children. And of course, this isn’t a comprehensive list. 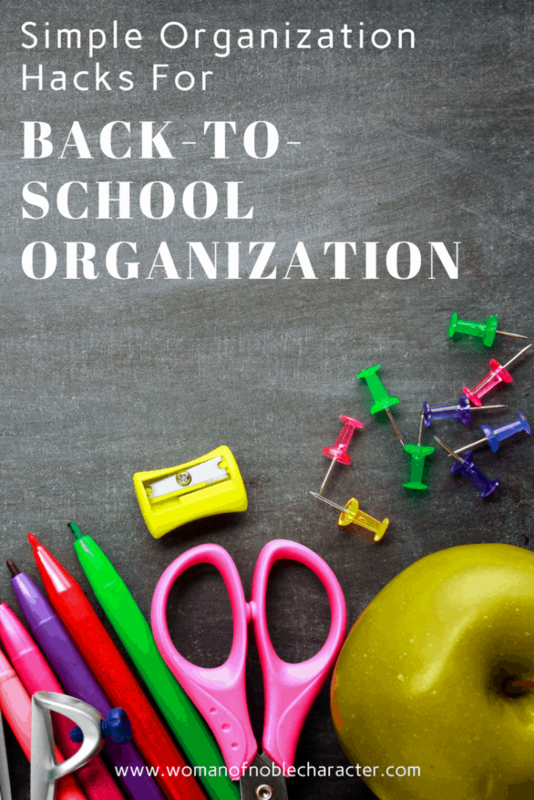 What tricks do you use to keep your family organized throughout the school year? Let me know in the comments below. 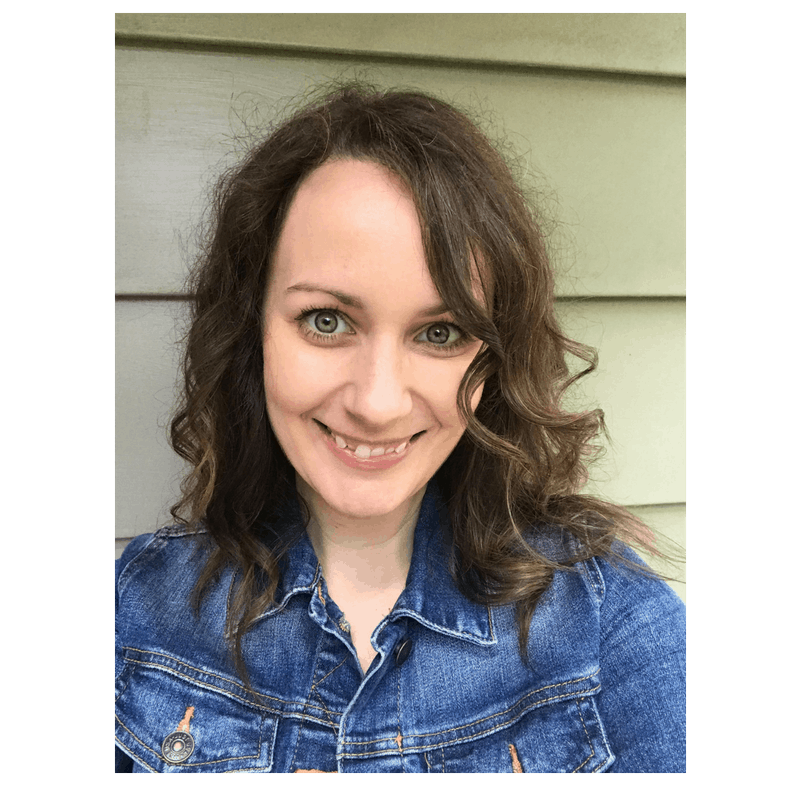 Sarah Brumley is a writer and educator with a desire to provide everyday families with the tools and strategies necessary to achieve their financial goals. Her website, Lemon Blessings, covers topics including budgeting, goal setting, saving, and debt management. When she’s not writing, Sarah enjoys spending time with her husband, pre-teen daughters, and three cats. Sarah can always be found on Twitter @sarahlbrumley or you can track her down on her blog at lemonblessings.com. Looking for ways to make mornings happier in your home? Check out this post on morning routines for children. Each of these areas can cause so much stress and pressure on both the child and the parent. Great ideas! Well thought out! Thank you, Anita! 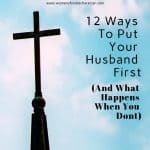 Sarah did an amazing job on this post and will save the sanity of moms everywhere 🙂 Thanks for stopping by!